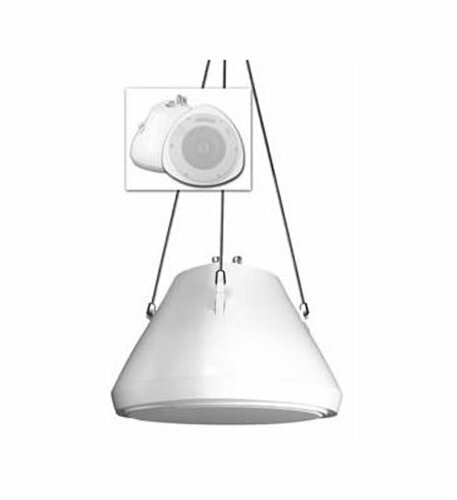 Speco pendant speaker. Skillfully combines style, convenience and value into one package and is perfect for situations where background music or paging is needed but ceiling mounting is prohibitive. 5" Polypropylene woofer with rubber surround. 1/2" Mylar tweeter. 95Hz to 20KHz frequency range. 30 Watts RMS/ 60 watts max. 92 +/- 2dB. 8 Ohms impedence. 70/25 volt selector switch. Transformer settings: 40W, 30W, 15W, 7.5W, 5W, 2.5W, 1W, 0.5W, 0.25W & 8 Ohm. Hanging apparatus included. SPCSP30PT. Country of Origin: China. RoHS Compliant: Yes. Type of Packaging: Retail Box. Dimensions: 10.5L"x10.5H"x7.5W". Weight: 5 lbs. If you have any questions about this product by Speco, contact us by completing and submitting the form below. If you are looking for a specif part number, please include it with your message.